"Drivers for the Intel HD graphics integrated in processors i3, i5 and i7 for notebooks and PC." Intel HD Graphics Driver is a pack of specific drivers for all the variety of the integrated graphics of Intel processors core i3, i5 and i7 for PCs and for notebooks. It is recommended to have installed the latest version for making improvements of the performance of games and applications as well, and for correcting possible mistakes or bugs that can appear while using the drivers on Windows. This is a specific version for Windows 7 32 bits. The purpose of the pack is to make it easier to find the driver you need for your specific set up without the requirement of an Internet connection to get the drivers. 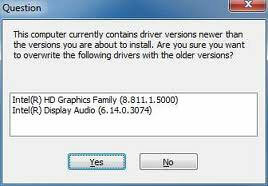 If Windows cannot find the right drivers automatically, perhaps this software will do the job for you. That is why the driver pack allows you to run just about any HD graphics piece of hardware on your PC set up. This could be a good idea to use if you are experiencing issues with the Windows provided driver running on your system and you cannot find the drivers by searching on the Internet. This driver pack will more than likely solve your problems for you if you could not find the drivers you need online. This pack covers just about all of the driver needs you could possibly need on all modern computer systems. If you are looking for the right drivers for your Intel HD Graphics on your computer, then give this pack a try and see if it solves all of your problems for you by grabbing this free download!